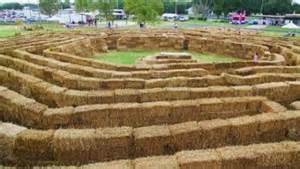 Emma lost her glasses under suspicious circumstances in a hay maze. She’d been hinting around about wanting new glasses and low and behold hers went missing. She apparently was well-versed in the “trying to find a needle in a haystack” only she went one better—a labyrinth of hay. She attempted to negotiate her loss via text message. Layce: We’ll talk about it when you get home. It won’t be pretty. Emma arrived home, having discovered she didn’t have a passport so she couldn’t defect to a Slavic country with no extradition policy. She brought her chaperone up to the door in a blatant attempt to diffuse the parental bomb. Tick, tick, tick. While Chaperone Lady (her name is being withheld in order to protect the innocent) and Layce discussed the logistics of the lost eyewear, Honey Bear darted out the open front door. She’d spotted a skunk across the street and now had it cornered. I ran after her thinking she might have a cat. It looked like a cat but I didn’t have my glasses on so I went in blind. Honey Bear took a direct spray to the face and backed away, yelping. I grabbed her collar so I could safely get her across the street. I was now soaked in skunk juice as well. Layce and Chaperone Lady backed away from both of us. “Don’t let her in the house! Or you!” Layce said. “Take her out back and take off your clothes,” Layce said. “I should be going,” Chaperone Lady said as she lept in her SUV. That night, Honey Bear had three baths and stayed outside. I had two showers and Layce had one. We laid in bed. 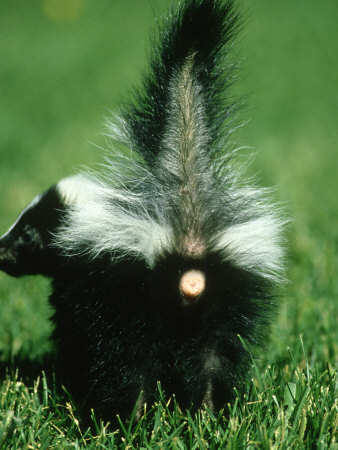 “I still smell skunk,” Layce said. We washed the sheets and went back to bed. In the morning a contrite Emma inquired about her punishment. “You’re grounded until you’re eighteen,” I said. Her eyes went big as saucers. “You’re grounded for a month and you might get your allowance back around June. Or maybe not,” Layce said. She wasn’t kidding. “And you have to wash Honey Bear a lot,” I added, “And spend quality time with her since she’s banned from the house until she smells better. “But she stinks,” Emma said. “Really? I hadn’t noticed,” I said, handing her a bucket and soap.